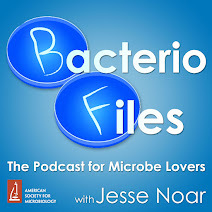 This episode: Filament-forming organisms help bacteria swim through soil and exchange genes with each other! Also, new feature: microbe of the episode! Berthold T, Centler F, Hübschmann T, Remer R, Thullner M, Harms H, Wick LY. 2016. Mycelia as a focal point for horizontal gene transfer among soil bacteria. Sci Rep 6:36390.